My first human-sized hat. I've made lots of doll hats. Of course I made this one without a pattern as I couldn't find one using the two yarns I wanted to use. Or at least I couldn't find one in the 10 minutes or so I was willing to give to the search before I sat down and started knitting. It looks less lumpy on, but I kind of like the way it looks off too ~ almost sculptural. I think I may be hooked on hat knitting. Lovely self-portrait, Dawn. One can tell how soft and cushy the scarf and hat must feel. Instant gratification at its best! I think the hat looks great. 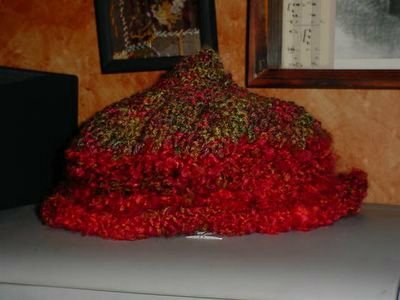 I'm a proficient knitter, but wouldn't know where to begin knitting a hat without a pattern. Well done.